Let's admit it. Getting 30 elementary kiddos to work in harmony (both literally and figuratively), is quite a major task. This is why the discovery of musical centers was very pleasing to me! As most wonderful ideas, this came from a co-worker, who learned it from and co-worker and shared it with many. (Thank you Shawna and Claire). Although this specific idea came straight from my little head, it all came to be because of learning experience as a substitute music teacher. Ducky Music Symbols Game can be played with 1 to 5 players. Thus making it a great game for students to play while the teacher is working with small groups. Here's a list of items used to make the game. The playing cards for the game were made from this wonderful link on Scholastic.com. The rubber duckies were purchased at a party store. With a Sharpie marker, each music symbol was written on the bottom of each duck. This could also be done with rhythms or notes on a specific clef. Once all the ducks were labeled and flash cards were made, the instructions on how to play the game and a key was typed up and glued inside the box. The key was added to the game for the students who might not remember what the music symbol looks like just by seeing the name. 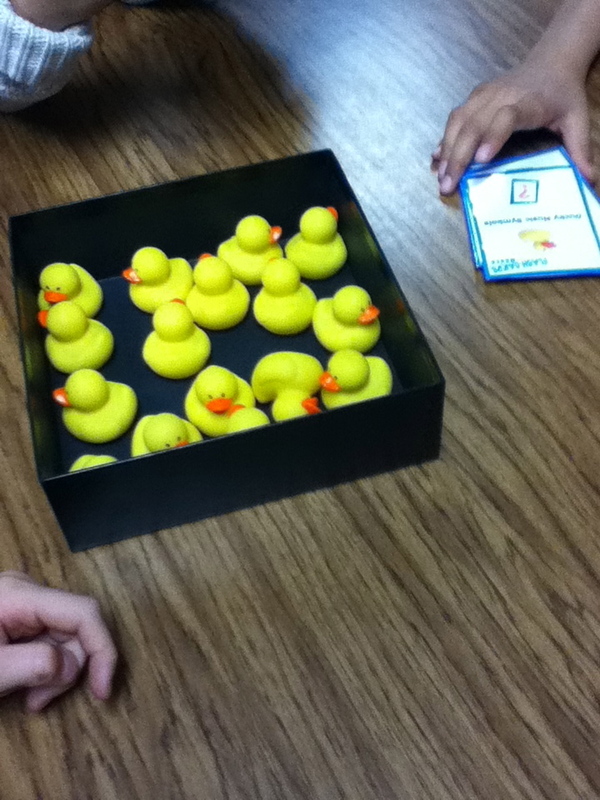 The original plan was to have a small container with water to have the ducks float on top, much like a carnival game. Unfortunately, these duckies continued to float face down, thus showing the music symbol. So, if you would like to use water, make sure that the ducky is heavier on the bottom than the head. *Please note an error in the key of the instructions. (mp should read mezzo piano, not mezzo forte). The kiddos really enjoyed playing the game and it gave me time to work with a small group that needed some extra help. Extra time to help students and kids learning music symbols through a game is a win-win! Have fun! UPDATE!! Here is a twist on the ducks. It shows that anything in the dollar store can work with a little imagination! Thank you Judy C. for sharing! Where did you get the picture of the duck for your flascards and how did you insert it into the flash card maker program? Thanks so much for your comment. I took a picture of a rubber duck that my son used to have in his toy box. Then I enlarged the picture to make the cover on the box. Unfortunately, I had to cut out each duck with the scissors to glue onto each card. I am sure there is an easier way, but I am just not sure how. Sorry that I couldn't be of better help. Yay! I've had dozens of little rubby duckies sitting in my room and not a clue how to use them! This is perfect!!! Thanks! This is so great, thank you! I've made my own version (couldn't find duckies) using plastic mini baby booties (from dollar store, shower favours?) and I've called it Blue Suede Shoes. Works for me, I love shoes! I'd be happy to post the materials I made if there's a way to do that. I love your idea Judy C.! Thank you for letting me share it!